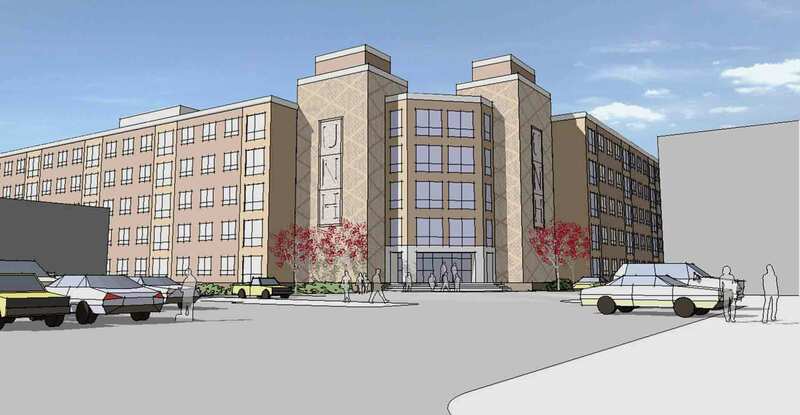 Trinity Financial retained Kenneth Boroson Architects to provide a design concept for a new student resident hall at the University of New Haven. The concept was provided on a fast-track basis over a two week period. The program provides for 70 suites (10 of which are accessible) of 5 students for a total of 350 beds; 10 Resident Advisor suites for a total of 10 beds and a director’s apartment for a total of 1 bed. The total number of beds is 361. 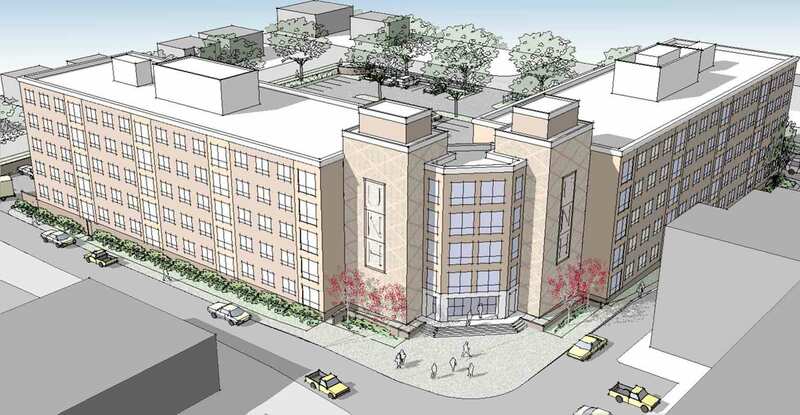 In addition there are common spaces such as lounges, seminar rooms, studies, a gym, a dining hall with a food service kitchen, laundry rooms, a rooftop garden and adequate parking. 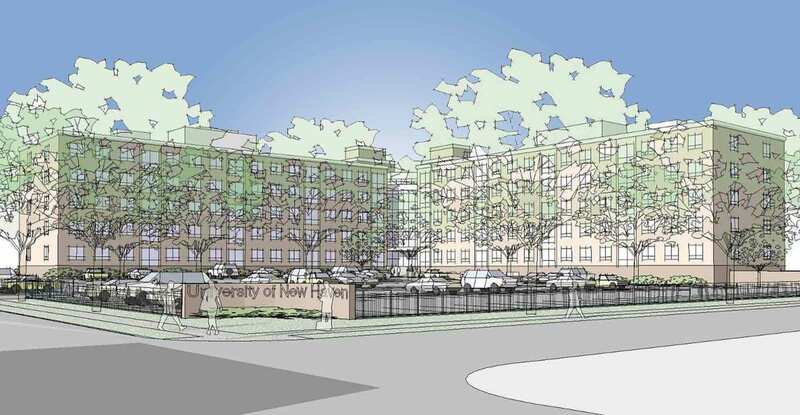 The development of the building’s architectural vocabulary is consistent with traditional university housing design. 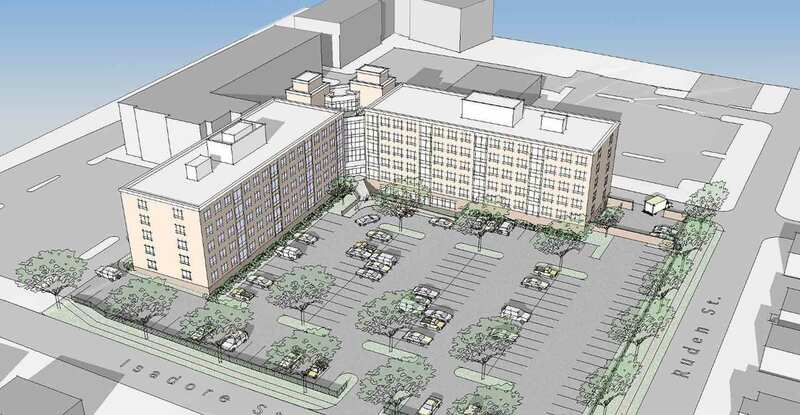 The student housing structure is organized as an “L-shaped building” with resident suites in each “leg” and public and service spaces in the core. The materials include brick, precast bands and/or multi-colored brick bands, aluminum windows, metal panels, and storefront glass. The roof is a single-ply flat roof and will have mechanical equipment housed in penthouse boiler rooms as well as a chiller cooling tower. Both of the large mechanical areas will appear similar with metal clad panels. Architecturally designed cornice lines, precast and/or brick bands will provide interest and delineate the architectural volumes. The masonry finishes and residentially-scaled windows will create a functional and aesthetically-pleasing student housing development. To provide a sense of the building fitting in with the neighborhood, the mass of the building is focused toward the higher university buildings to the north and is located as far away as possible from the lower-scaled residential neighborhood along Isadore Street and Ruden Street. The residential entrances are marked with canopies and/or porches on the south and north sides of the entrance lobby.